s p i n n i n g d a y d r e a m s: Spindling Class with Abby Franquemont :" Now go do it right!" Spindling Class with Abby Franquemont :" Now go do it right!" Here's the proof. I saw Abby Franquemont with my own eyes. Even though I recognized her when I first saw her, I felt instantly that I have never seen a picture that does her justice. And my own picture continues in that tradition. Here she is, browsing through some of Ellen's enviable fiber book collection. 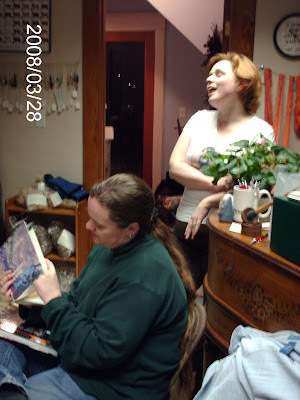 Behind her is the ever generous Beth, who in her own philanthropic way invited Abby to her shop so we could all see her. 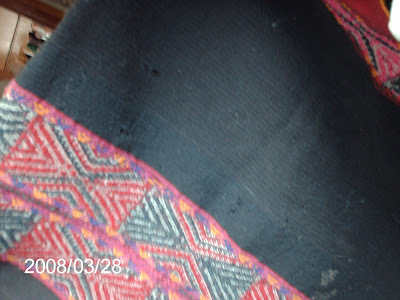 Here is a picture of some spindle spun cloth that Abby brought ....I don't remember the name of it, but she wore it as a child in Peru, as generations of children had worn it before her.....the threads here are fine but very firmly spun, making them almost impermeable to water. What I love most about this cloth is the striping...see the striping in the center black panel? That is achieved by variations in twist direction.....and allows the cloth to lie flat in spite of the great amount of twist in the threads. * you only need the simplest of tools to spin, and spin well and fast. 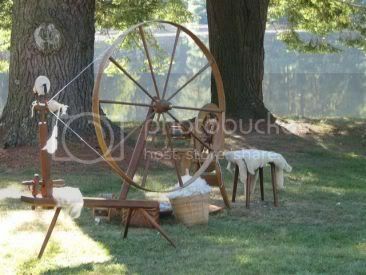 * the spindle allows for the highest level of excellence in spinning, even to a greater extent than a wheel. * rethink twist. The more you use, the more durable your finished textile will be. Durable is good, and does not in any way preclude loveliness. When you think about it, in this day and age, spinners are the only ones who have an opportunity to produce durable textiles. Textile mills are simply not interested in turning out products (either yarns or fabrics) that will last years, let alone generations. Yet before the industrial revolution, handing down textiles from generation to generation was expected. Some of the techniques I picked up on quickly....many still feel awkward to me. I will be practicing for a short time daily on my low whorls til I am comfortable with these techniques. Some of the plying techniques I am not sure that I even understand! Sigh. The truly beautifully spun yarn that was being passed around, in tandem with my own bottom whorl awkwardness, was a bit humbling. But no matter. When faced with failure, one can simply handle it in the Andean way....."Now go do it right!" And so I will, until I get it right. 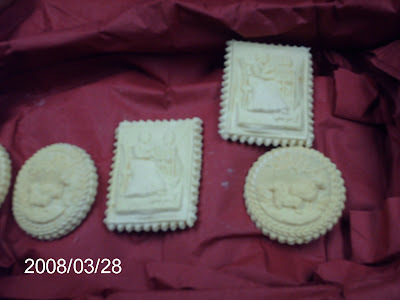 Here are some lovely cookies that the marvelous Faina brought along. Don't you think that they are pretty, with the spinning ladies, and little sheepies? Well, they were yummy too. Faina can spindle up a storm and designs lace. (think Forest Path Stole) I sensed that she could coax out lovely yarn no matter what spindle she was given, top whorl, bottom whorl, or supported; it mattereth not. And she was only one of the talented spinners who surrounded me. I very much enjoyed being in the company of other spinners....though I was so busy spinning that I beg you not to ask me their names.... all in all a lovely time. What a great experience you had! I saw on Abby's blog that she was having a class! What a fantastic time it must have been! I look forward to seeing all the things you learned put into practice! I do believe you are one of the best photographers whose art I have the pleasure of viewing! Oh man! We were in southwestern Michigan on Friday and I kept telling my husband that we should take a "small" detour to the Spinning Loft so I could check it out. Had I known what was going on there, I would have insisted. I'm so envious! I can't imagine a more exciting class. Wonderful! I've held Abby in the highest esteem and read her blogs as she prepared for the class. I'm sure you learned tons! a pastor's wife, mother of seven children. I see my Father's hand in the world around me, and imitate with joy. Longtime daydreamer.